(Newser) – The Republican Party's 2012 presidential nominee isn't happy about what the 2016 candidate is saying about the 2008 nominee. In a tweet Tuesday night, Sen. Mitt Romney wondered why President Trump had renewed his attacks on John McCain seven months after the Arizona senator's death, USA Today reports. 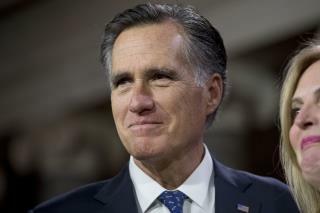 "I can’t understand why the President would, once again, disparage a man as exemplary as my friend John McCain: heroic, courageous, patriotic, honorable, self-effacing, self-sacrificing, empathetic, and driven by duty to family, country, and God," Romney said. You can say what you want about McCain, but the one glaring fact is McCain was in Vietnam and Donnie was in New York nursing a terrible case of “Bone Spurs”. Enough said. Romney is just pissed because obama defeated both McCain & him. ....... then Trump came along (everyone said h3 had no chance in hell) and became the prez. Haters gonna hate. They don't call him Mitt the Twit for nothing..